In this VETgirl online veterinary continuing education blog, Dr. Garret Pachtinger, DACVECC review's the DO's and DONT's of dextrose. While dextrose can be a life-saving therapy, it also can cause disease and illness if not administered appropriately. What are some VETgirl dextrose DONT'S? 1) VETgirl does not recommend administering SQ fluids with dextrose as this type of fluid provides a good medium for bacteria to grow which can result in cellulitis or abscess formation. 2) VETgirl also does not recommend giving dextrose in solution as a CRI greater than 5% via a peripheral vein, as the increased osmolarity can cause phlebitis. 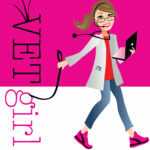 What are the VETgirl dextrose DO's? - To make a 2.5% solution add 50mL of 50% dextrose (or 25g dextrose) to a 1L bag of fluids. - To make a 5.0% solution add 100mL of 50% dextrose (or 50g dextrose) to a 1L bag of fluids. 2) For live-saving bolus therapy in a hypoglycemic crisis, supplementation should be implemented quickly! Use this shortcut for those crisis situations: 0.5–1.5 mL/kg of 50% dextrose, diluted 1:4. This can be followed by dextrose in solution as noted above. Most importantly, recognize when your patient may be hypoglycemic first (e.g., xylitol toxicosis, neonate that is doing poorly, lethargic patient, seizuring patient, etc.). I would like to know your stance on how long you keep a bottle of dextrose once it is punctured? Once punctured, do you refrigerate? Yes, we do refrigerate it. We honestly use it so quickly in the ER, so we use it within a month. I’m fairly new to the vet tech field and just to clarify, do you need to take 100 ml out of the bag of fluids, prior to injecting the 100 ml of 50% dextrose into the fluid bag, to make it a 5% solution? Or is that already accounted for? Thanks! LG, since no one replied and I found thins I thought I would answer. To be 100% accurate you would have to take out as much fluids from the bad as you would put in the dextrose. To make 1L total fluids. Good example of this is when calculating for dextrose. 5% is what you need and you have 50% dextrose. You divide 5/50 = 0.1 then multiple by the amount of fluids you need total. 0.1*1000ml = 100 ml of dextrose. Now let’s calculate 25% for 1 ml. This makes sense in a second. You divide 25/50 = 0.5 then 0.5* 1 ml total solution. It’s 0.5 ml dextrose for 1 ml total solution. You would take 0.5 ml of fluid from 1ml syringe and add 0.5 ml of dextrose to the remaining. 25% of 50% is half. Half dextrose and half fluid. You wouldn’t add 0.5ml dextrose to 1ml of fluid because then 1/3 is dextrose and 2/3 is fluid. You would get like 16.6% solution then. Does this help?